Just to show I have been a busy bee, here are some snaps of a quilted throw and matching cushions that I recently finished. The throw has sat in my studio for months, needing only 40 minutes of quilting to be finished, but with everything going on, I just haven't had that 40 minutes. However, I knew I was going to meet Jane, the editor of Popular Patchwork, at the Loch Lomond Quilt Show and this provided the impetus to finish this UFO. The pattern, which I had designed using EQ6 software, was rather wasteful and from the left overs, I made three matching cushion covers. I didn't have cushion pads to fill them when I took the photos, which is why they look a bit flat. So Jane now has them for proper styled photography and hopefully I'll get them back in time for my Open Studios event which is taking place from 12-20 June in my studio. As part of this I was featured in our local paper last week. This is the link to the article. I'm not quite sure what it says as I was so excruciatingly embarrassed reading about myself, I didn't get past the first paragraph! I've got lots of ideas of what to do for the Open Studios (it is the first time in our area), that I really need to get a move on in tidying my studio so that visitors will actually be able to enter it, rather than peering in at the door as if it was a museum exhibit! It's exciting that there are hopefully going to be lots of visitors coming to see what I do, but as it is the first time, it is all a bit unknown at the moment. There is also an exhibition at Delta Studios in Larbert, related to the Open Studios and I drove my Shelter pieces over there, the other week. I took the five smaller ones first and then decided that I really had to take the biggy over too. All the seats went down in the car, bar the driver's and we really struggled to fit it in. We knew it went in as it had gone to the Loch Lomond Show last year, but it took us ages and some brute force to actually get it in this time. Goodness knows how I get it home, but at least I don't have to worry about that for another month. 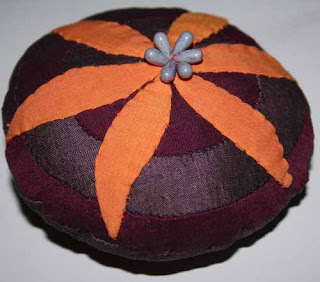 A couple of entries ago, I showed some badly photographed drawings for a pin cushion I wanted to make. Here is the final version, all stitched by hand. 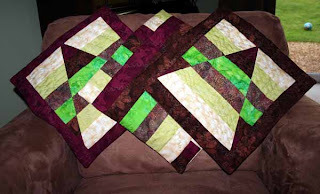 It was very relaxing to do and I love the richness the shot fabrics add to the colour scheme. I also dug into my bead collection and actually used six of them - so for one month only I may have used less beads than I purchased... I've had these ones for a while and I really liked the oval drop shape. This is going to be a project in Popular Patchwork sometime soon ... once I've written the instructions. I've been a bit quiet on the posting front as I have been frantically working and realising that there are not enough hours in a week, let alone a day! The kids art classes are progressing and there is going to be some work to show at the end of term exhibition on 19th June. It's really fun to see what catches their imagination and also to discover their lack of critical skills. In some ways, it would make life a lot simpler if after the first drawing/ stitches I could say: 'yes it is fine and no I wouldn't change anything' and dive into the next thing! Saturday's class is going to be paper collage, looking at Matisse's paper cut outs and finishing off painting their mod-roc sculptures. 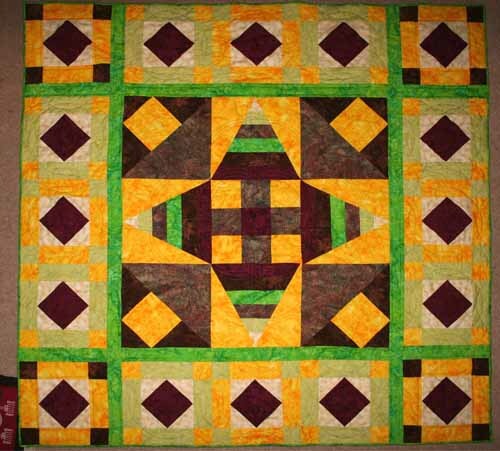 The reason last week was so busy was the Loch Lomond Quilt Show. 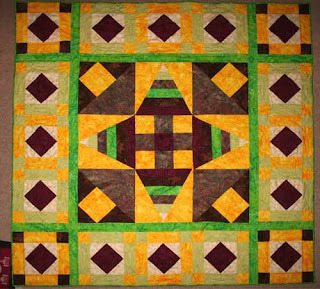 It's lovely having such a friendly show so close to home and I spent three days enjoying the quilts and talking with other quilters. 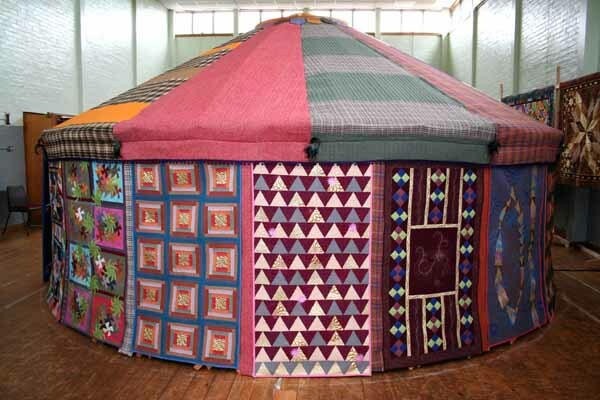 The highlight for most visitors, including myself was Linzi Upton's full size Quilted Yurt. 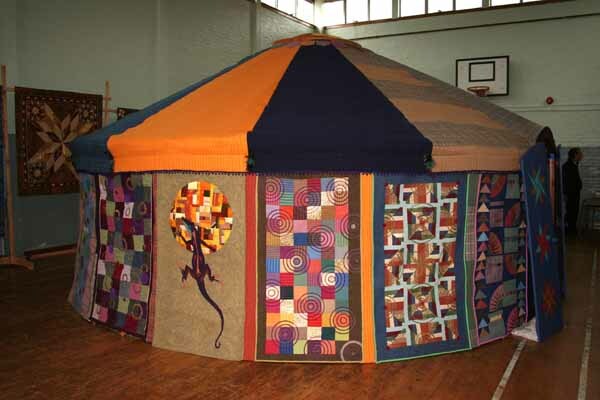 It filled the room, with its beautiful quilted panels and Harris Tweed roofing. It had many great details, which were only found on close inspection, like the twig deer head inside, made by an artist friend of Linzi's (I forgot to note down the name, but it would be worth finding out about). Linzi's trademark is using gold lame, a fabric I normally dislike, but the restrained use of it on the panels added an opulence to the walls and raised them up to something special. Other than the Yurt, I also enjoyed some of Hungarian blue and white quilts. I really loved this one by Somogye Trenine for its triangular borders. There were also some which used a terracotta or red colour along side the blue and white and they worked well. Unfortunately, the lighting wasn't great for photography, so I don't have any images. Jane Lloyd had a fantastic selection of her work in St.Mungos. 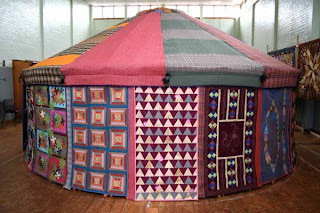 I have admired her work in the past and in fact I have written about it, back in 2007 after seeing it in a European Art Quilt exhibition in Mulhouse, France. 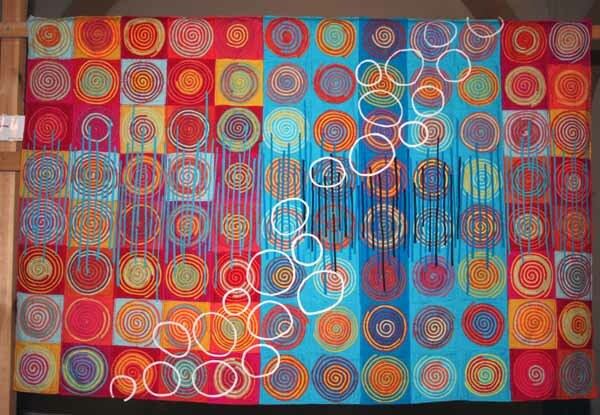 Her pieces are very vibrant and I love the way she repeats elements again and again, working through them until she understands a spiral or arch completely. Finally, at Lomond Shores, there was the Anglia Textile Works with their quilts hung against the windows of the Gateway Centre, with a backdrop of luscious green leaves. 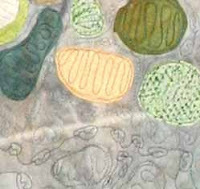 I particularly liked Kathy Colledge's Branch-lines at Matlaske, which was painted and then quilted. It was very effective. 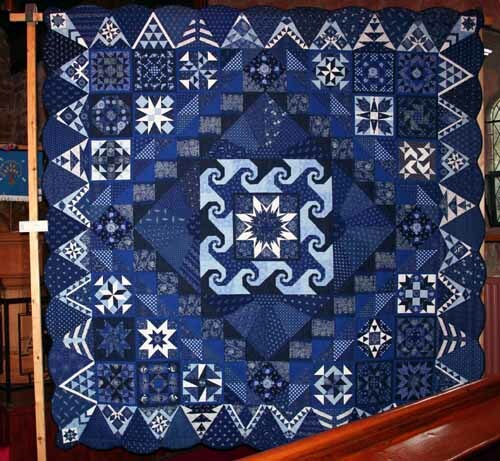 As I am meant to writing an article about this for Popular Patchwork, I'd better not say anymore and keep the rest for the magazine - it is going in the July edition (on sale end of June), once I've written it, rather than just writing my blog! 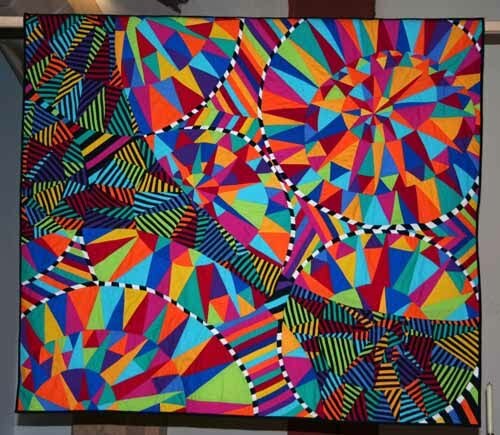 If you haven't been the Loch Lomond Quilt Show, it is well worth a visit, just because it is so friendly and because the churches which are the exhibition venues put on fantastic tea and cakes - West Kirk is my firm favourite and there was no disappointment in the filter coffee with meringues and banana loaf this year. I have been spending a significant amount of time planning recently as yesterday Dawn and I began teaching our new junior art classes. We had realised that there was a gap in our area for children's classes years ago, mainly becuase we wanted them for our own children and so finally, yesterday we were able to start, with both classes basically full. We had asked the parents permission to take photos of the children's work, but we were so busy yesterday that we forgot. The first class for 5-8 year olds was manic. By contrast the 9-12 year olds felt like an oasis of calm! I had challenged one of the older ones to look at her pet guinea pig and work out how to draw it by looking at the shapes. This was partly because I don't know what a guinea pig looks like, so I couldn't help straight away. A few minutes later, she challenged me to draw out my own nameplate for my sketchbook as I admitted I had not done so, even though this one the first task we set the kids. 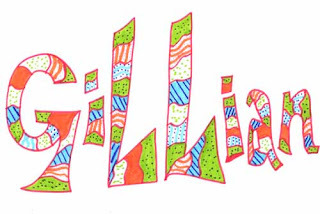 So here is my nameplate, ready to be stuck in place, executed using the same style we had suggested to the children. The outline should have been black, but I did it whilst we were at the Safari Park this afternoon whilst the little monsters were playing in the sand and I only had a few colours of pens in my bag. We had loads of things lined up for class yesterday, so we wouldn't run out of things for them to do. We didn't even manage onto the main activity as everything took longer than expected, which was great. So we have revised our lesson plans and next week we are going to be using mod-roc to make sculptures. I hope the kids like getting messy! I've just had the fright of my life this afternoon. I've spent all weekend in the studio working on my own as Richard has taken the little monsters away so I could work. The house is amazingly quiet and I'm not used to it. I used to be a quiet person until we had more than one child. Our house is generally very noisy. To take advantage of the lovely weather and the first real chance this year, I left the back door open to air the house whilst I was working upstairs. When I came down to make a coffee, something moved in the kitchen. I jumped and yes, I'm sorry to admit, I screamed, or rather squealed. Rather pathetic, I know. It was one of our neighbour's cats jumping up onto a bench and smashing Richard's precious seedlings at the other side of the room. I'm not sure who was more panicked. I got a grip of myself - it wasn't an alient invader, just a scared and trapped cat and tried to work my way over to it to get it out, talking to it a calming voice, feeling rather silly for screaming. Eventually I got in a position it could run past me and out the door. It took ages for my heartbeat to get back down to normal levels. Maybe this is why our only pets are our new tropical fish. As I keep saying looking after the kids is more than enough work for me! Hurrah! I've finished the basic machine quilting on my latest piece. I remember being driven to hospital to have my second child, telling Richard that if I ever even vaguely consider having a third child remind me how much I hate pregnancy and shoot me so I wouldn't do anything so stupid. 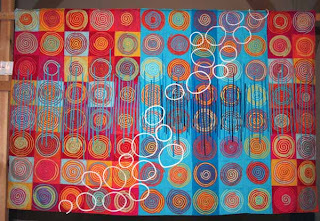 I think I feel that way about using an all over free maching pattern on a large quilt. It's the first time I've tried it (the quilt is currently 40 x 80in, but it is going to be cropped) and I think that for the next piece more variety is needed - if only so I feel I am getting somewhere. This has taken me the full month of April to do, working on it most days. My control of the machine has improved hugely which is fab and it is worth it just for that. 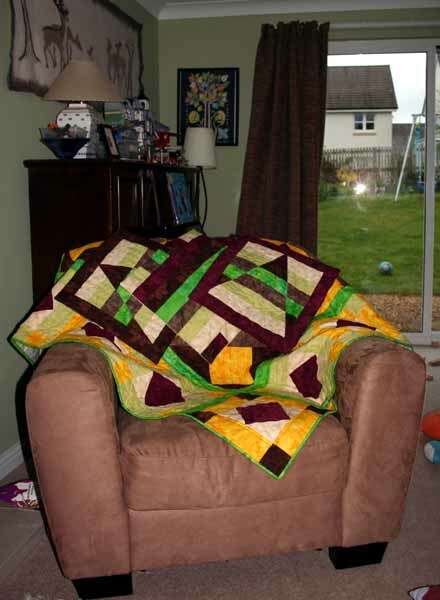 The quilt is still not finished, but the majority of the repetitive work is. However, don't take me at my word when I say never again ... our third child is testament to that!